On my recent whirlwind trip to London, I was very good and didn't purchase anything in Duty Free. We'll not acknowledge that it was mainly due to lack of time before getting on the plane, but still, no purchases were made. During the day, we'd about twenty minutes to shop between meetings and Emma had mentioned she'd wanted to try and visit the shop & Other Stories, so off we went and some damage was done! Emma informed us newbies to & Other Stories that it's the big sister to H&M and although it's not in Ireland yet, we can only hope that they get their behinds in gear and open up shop soon! I mean, they'd the euro prices on the back of things already, so the hard work is done! They sell everything from clothes to bags, accessories to makeup and we could have spent ages in there. Like an episode of Supermarket Sweep, we ran around trying to find some gems and I think I chose wisely with my sneaky buys. 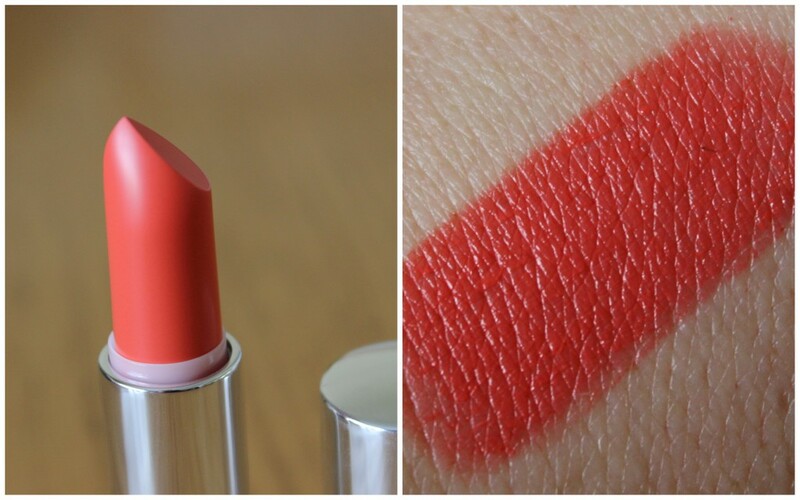 Even though I've a bajillion coral lipsticks in my stash, I was instantly drawn to this beauty, Burdet Orange. It was £12 (twelve pahhhhhnd) and feels creamy and luxurious on the lips, not to mention the swatch below is one swipe of the bullet. I think we're going to get on fabulously during the summer. In the summer, I'm all about coloured liners and these guys were half price at £3 each. 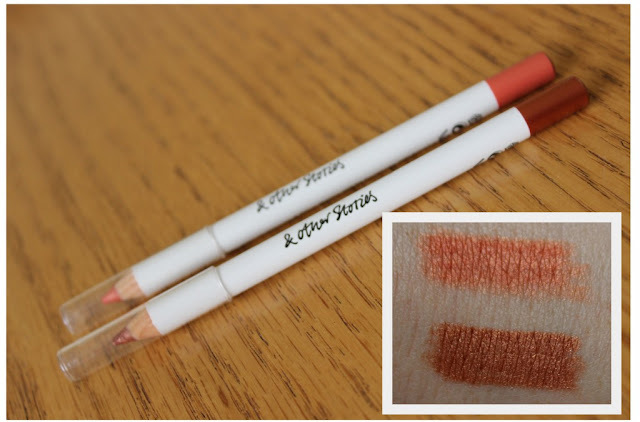 Marrabas Orange (top) and Birrus Rust (bottom) were made for my green eyes but would work well with all eye colours too. I've been wearing them under my lower lashes with a neutral eye and they add enough colour and interest to an eye look to keep it office friendly and sure summer is all about metallics anyways. 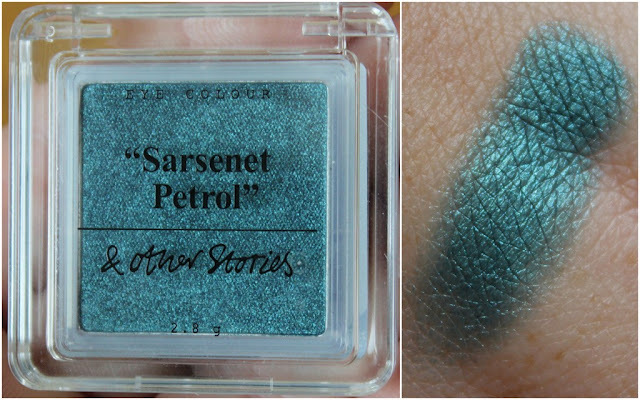 I hovered over the eyeshadows for ages, trying to pick the perfect one. One that I didn't already have in my collection so I wouldn't have to justify the purchase to myself. I decided on Sarsenet Petrol, a stunning metallic green shade that looks like Barry M's Teal nail polish, in eyeshadow form. This was £7 and I can't wait to play with it. Check out the rest of the products on the & Other Stories website and stay tuned for some makeup looks featuring these products. Wow… sounds interesting, hope you have got good deals and hope all a with reasonable prices.. Stumbled upon your blog recently & really enjoying it. Keep up the good work my good lady! I loooove my & Other Stories lipstick. I just picked up the one, along with a blush and some nail polish, but I wish I could have them all. I got Tissue Pink, a sort of berry shade, and it's sort of my go to lipstick now. That coral is gorgeous! Definitely hoping it makes its way here! Oh man I needed those eyeliners, they are so beautiful! Can't wait to see what you will do with them :) I wish they'd open up more stores, I'm forever reading good reviews!